Our beautiful Acrylic Screened Rectangle award is the perfect way to showcase any commemorative event. With plenty of room for engraving and personalization, this award can be laser engraved, color-filled, or screen printed to capture just the look you want. This award is available in three sizes and comes mounted on an elegant clear acrylic base. This item comes in a White Presentation Box. 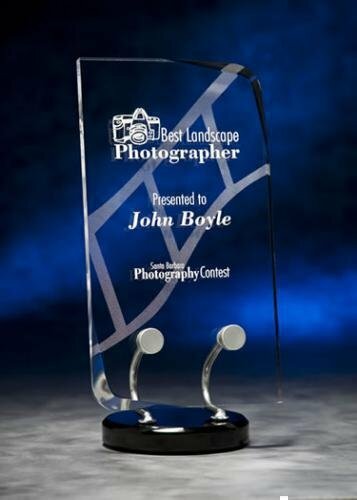 A rectangle shaped acrylic award with a soft curve edge, attached to a satin wire from sitting on a black acrylic base. Full color imprinting available as an optional imprinting method for this acrylic award. Reflections Emerald Mirror Plaque with backing and hangers attached-Individually boxed.